In July 2017, information days were held to advise agribusiness on supporting sheep farmers through the dry season. Where sheep are important to a farm business, current wool and sheep prices mean that the sheep enterprise is still very profitable. The overriding message was to prepare early for the worst, but stay positive and support each other. This page provides a summary of the presentations by Ashley Herbert, Agrarian Management and John Young, Farming Systems Analysis Service. The autumn of 2017 saw lower than average rainfalls in the south of Western Australia and a significantly delayed break that impacted on pasture germination and growth. 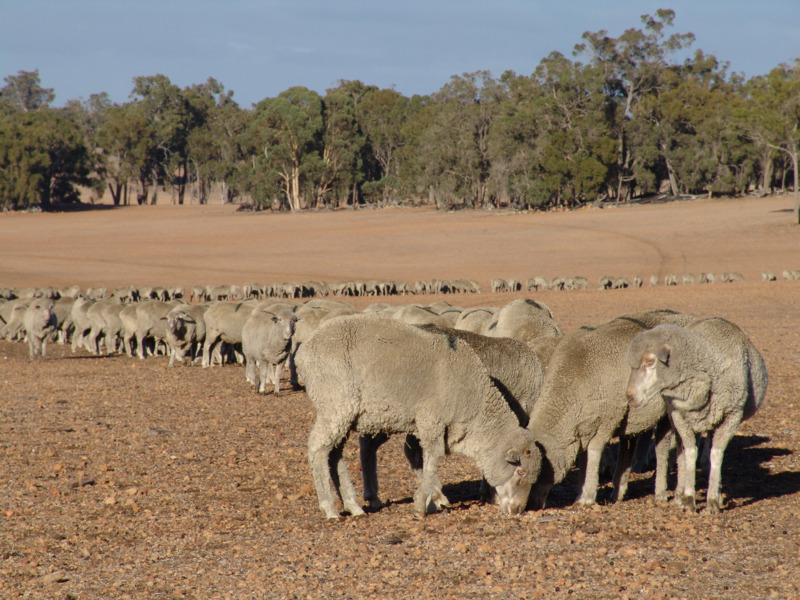 There were quite severe conditions in the north and the east of the Wheatbelt in July and the low pasture growth would limit feed availability to sheep in spring and summer (Figure 1). July Feed On Offer (FOO) levels (a) 2016 and (b) 2017, Pastures from Space (Landgate). How is the 2017 drought different from others? Market conditions for sheep are excellent at the moment. There is record profitability for sheep both nominally and Consumer Price Index (CPI) adjusted. Adjusted for CPI shows the second-highest profitability for sheep in the last 30 years. This is a great price incentive to keep sheep on the farm. There are also more options to sell into markets, for example lighter lambs can be sold into air freight markets that didn’t previously exist, and there is a reasonable market for livestock to eastern states. This means the pressure to act is not as great as in previous droughts because it is unlikely that the sheep market will collapse as it has in the past. Sheep farmers have more sophisticated knowledge to prioritise the sheep to keep. This includes information on ewe nutrition developed from the Lifetime Ewe Management program, as well as on the impact of reducing ewe nutrition, and the cost of losing weight or value in getting ewes to gain weight. The industry didn’t have this data in the past. A poor season doesn’t just happen overnight; it is an incremental process that creeps up on sheep farmers. People think it is going to rain, wait for it to rain, hope it is going to rain, and at some stage it becomes obvious that things aren’t going very well and decisions need to be made. The timing of decision-making is very important to the options that sheep farmers have, and how effectively those options can be employed. People often leave decision-making too long, putting off the difficult choices, until they are left with few options, which are unpleasant and very expensive. It is important that sheep farmers have cues that trigger decision-making. One of those cues is whether rain has been received by the end of May. By making decisions in good time, farmers can keep their options open and make decisions at the best time when those decisions can add value to the business. Sheep farmers benefit from being proactive and decisive. Phase 1: Does carrying capacity need to be increased (produce more feed)? Phase 2: Does demand need to be reduced? It is important to recognise what phase the sheep enterprise is in: is it in the phase when the business tries to carry the current sheep numbers, or is it at the stage when the business needs to reduce the demand. There are key decisions that go along with those phases. Every year a sheep enterprise will enter the first phase, increasing carrying capacity by feeding sheep. Some years sheep farmers might feed earlier, a bit longer or a bit more than others; the business might reduce crop to increase pasture area. This is all about carrying the sheep that the business has. Some years of poor seasons and late breaks the sheep enterprise moves into the next phase of offloading sheep to reduce the overall feed demand, utilising early stock sales and agistment to maintain a core flock of sheep. What is the thinking process farmers need to follow? What to do if cash flow is restricted. Why does this year need more planning than normal? In 2017, by July a lot of regions were well-past the first phase of increasing carrying capacity, and were into the phase of rationalising demand. Farmers can use guidelines to prioritise this process to help make the decisions in a rational and objective way. Normally in the spring farmers use available feed to put condition on their ewes to get them ready for joining, and grow the lambs to get them ready for sale. Indications for 2017 are that most areas of the state will have a reduced spring flush, and some areas of the Wheatbelt may not have a productive spring. The implication of a poor spring is that it reduces the cheap feed that farmers normally use to fatten their sheep, reducing liveweight (LW) gain of lambs and adult sheep. Anything that affects spring has a huge effect on the condition of the sheep going into summer, affecting carrying capacity and liveweight performance. When things don’t go well, farmers hope it will rain, and there is worry then mad panic when it doesn’t. This is a normal process; the trick is to get from worry and panic to decisions and then actions. Work to a plan: It may be an exit strategy (see below) or another sort of plan. Work to it with discipline. The plan can be modified when new information is received. Consider the physical resources available: eg sheep, infrastructure, water, people, grain. Finance (cash in bank, bank finance): This puts some constraints on what a farmer can do and what the time frame is. Without finance, time constraints are tight and sheep farmers need to act quickly. Emotion: It’s normal to be stressed in these times but if stress affects decision-making it creates problems for the business. Talk to someone. Farmers who are unable to make decisions because of the stress must rely on people around them to help, in particular to add some structure around their decision-making to get them back on track. It’s not useful for an adviser to just tell the farmer he needs to ‘take control’. Farmers need to be objective wherever possible to get decisions based on fact and clarity. Emotional, subjective decisions have a real risk of being inappropriate. Intuition and gut-feel have a role but should not be the only information that a decision is based on. Advisers should be asking their clients: do they have a plan, what is the plan? If they don’t have a plan, act together to get one organised. What is the worst case they can think of? What is the most likely, and what is potentially the worst to expect? Consider the risks that are rational, and get a grip on the cash flow because that gives farmers options within a time frame. Sheep farmers benefit from having an exit strategy: a pre-planned structure of how they are going to manage the seasons as they come. It is an orderly plan to back out of the season and keep things in control. Farmers who have an orderly, well-thought-out plan before they get into a situation can keep in control and have confidence that things are manageable. The focus in August for day-to-day planning should be on the next two or three months. It’s too hard to think six months out as there are too many variables at play that can’t be pinned down to make good decisions at the moment. By late August-early September, farmers will have more information to make decisions for the next two or three months after that. However, at the same time they do need to have a view on what could happen in the next six months: what is the best case, worst case, and what is most likely. Budgeting is important because it helps the farmer to feel in control and objective about what is going to happen and it helps to keep a firm view on the cash flow and capacity to take advantage of various options. For it to be useful farmers need to monitor the budget closely, month to month and budget to actual, to identify whether they are underspending or overspending. This helps keep them in tune with their cash capabilities, and what operating capital they have. It is important to plan supplementary feeding early. Work out what will be needed and buy the grain when it is well-priced. The risk of feeding is in the timing. If grain purchasing is delayed, everyone else is in the same boat and the price will be higher. The problem then is that when grain is expensive people feed less than they should. Farmers with grain on hand that they bought well are going to be able to feed their sheep what they need. Under $400/t for lupins is pretty good. Farmers should expect that lupin prices next year will be high and the risk of carrying excess lupins into next year is low. The earlier that sheep farmers recognise they need to sell sheep and act, the quicker the sheep are off the farm and the better value those sheep will make. If farmers wait until they have no option but to sell sheep, the risk is that everyone else is doing the same thing, the price has come off, and the sheep may not be in the same condition that they were a month ago, so the value is less in a depressed market. Farmers that get the timing of sale right can make good money. Why keep sheep at all? Why would farmers consider keeping sheep at all when it is potentially expensive and challenging? In a historical context sheep are currently quite profitable, and the fundamentals are very strong for sheep profit to remain high. This is a good reason to keep sheep in the farm business. Last year Agrarian clients at Kojonup achieved an average operating profit of $48 / DSE (Figure 4). Out of this the farmers paid interest, drawings, tax, overheads. It will be a bit less this year because of seasonal conditions. When the 2016 level of sheep profitability is compared with the wool boom of the late ‘80s correcting for CPI, today’s profitability in sheep is very close to the late ‘80s. There is a real boom in profit in sheep and it is substantially more than it has been. When deciding whether to keep sheep in the farm business, farmers need to look at the farm operation and identify what value the sheep bring. If there is a strong role for the sheep in the farm business then it is important to carry as many sheep as the business can through a difficult spring. There is a lot of work and money and some risks involved in carrying sheep through a poor spring but the returns are there. Feedlotting sheep is a big commitment. If farmers are good at it and prepared to put in the time and effort there are good returns if sheep are good for the farm business. Risk and reward to other livestock. Every sheep kept on the farm affects the ones next to them, for example what the wethers eat affects the breeding ewes that are intended to remain on the farm into 2018. Farmers currently have some solid options for selling lambs in this season. The air freight market allows a market for lighter lambs. Weight grid is 12-22kg dressed. Shippers. It’s all about condition rather than frame size. While lambs are typically weaned at 25kg, this year 20kg will be more likely. Farmers need to plan what they will do with sheep and lambs to get them into markets. They may need to feed sheep $10-20 of grain up to a point to be able to move them off the farm. What class of sheep is the priority to keep and feed?